Is there a sure-fire recommended dye for covering red bleach spots on a black tee? Message: My wife is a cleaner and wears black tee shirts. From time to time she gets bleach on them which leaves a red mark. I tried dyeing the tee shirts with shop-bought dye but it doesn’t work. Is there a sure-fire dye you recommend? 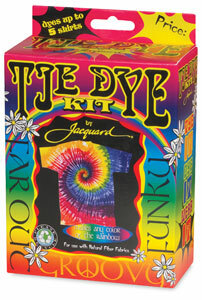 First, cover up the spot with a fabric marker, then use the fiber content of the shirt to choose the right kind of dye. Since dye is transparent, after you dye the shirts, both the background and the spots will get darker at the same time, so the red spots will still be lighter in color than the rest of the shirt. The best solution for this problem, generally, is to buy a good fabric marker, specifically sold for decorating fabrics, to color over the spot. A permanent marker that is not labeled as being for fabric, such as a Sharpie pen, will work for a while, but will wash out more quickly; if you use such a marker, be sure to keep it on hand to recolor the spots when you need to. If the results are not good enough by themselves, you can combine using a marker to fill in the spot with overdyeing the entire short a darker black. Are the shirts 100% cotton, or are they a cotton/polyester blend, or something else? If they are a polyester blend, then using a dye intended for cotton (including all-purpose dye) will not work. Even a low-quality dye will work for a while to overdye a 100% cotton shirt a darker black, but only if you use a large amount of dye, as otherwise you will get a lighter color than black. All-purpose dye tends to produce a color other than black, such as dark green or dark purple, but if you use two or three times as much dye, the results will be blacker. One pound of t-shirts (weigh while dry) requires two boxes of all-purpose dye to get a good rich dark color. All-purpose dye tends to wash out quickly, though, so it is important to make it more permanent by treating it afterwards with Retayne or another cationic dye fixative. If the t-shirts are a cotton/polyester blend, you have an entirely different problem. Polyester cannot be dyed with any dye that works on cotton, so you will have to use two different dyes, a disperse dye for the polyester part of the blend, and another dye for the cotton part. All purpose dye, in spite of its name, does not contain any dye for polyester, so it will not work for this purpose. However, if you can find a supplier of Jacquard Products, you can combine their iDye Poly and their iDye for Natural Fibers together, to dye both fibers at once. If you can’t find the dyes you want locally, there are several sources from which you can order your dyes online. See my page, “Sources for Dyeing Supplies Around the World“, scrolling down to the section including Australia. Kraftkolour, for example, sells Procion MX dyes which are an excellent choice for 100% natural fibers, such as cotton, as well as iDye Poly, which is ideal for polyester blends when used with iDye for Natural fibers to dye the cotton portion of the blend. Also see, in the Frequently Asked Questions section of my website, my page “How can I fix the bleach spots on my favorite clothing?“. Be sure to check the last section, in particular, “Damaged fiber”, explaining what to do about the fact that the bleach that created the red spots also weakened the fabric in that spot, and may continue to do so, though at a slower rate, unless the bleach is neutralized. This entry was posted in discharge and bleach on June 25, 2014 by pburch.